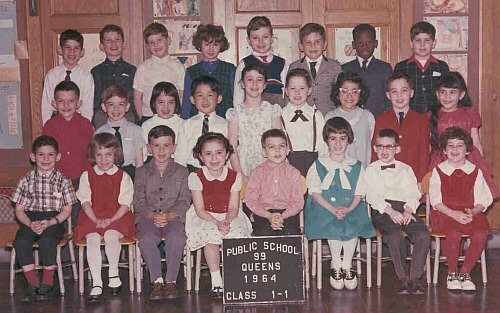 A Picture History of Kew Gardens, NY - Class Pictures - PS99 Grade 1-1 1964. Front Row (Left to Right): Steven Horowitz, ?, Arthur Kupferman, Rosalyn Levian, Richard Trommer, Stacy Gerrard, ?, ?. 2nd Row: ?, Steven Reynolds, ?, Yoshiahiko ?, ?, Tommy Nolan, Susan Kagan,Billy Francullo, ? 3rd Row: Howard Roth, Steven Leibowitz, ?, Margarita Wlodinguer, ?, George Bubaris, Lennox Gray, ?.